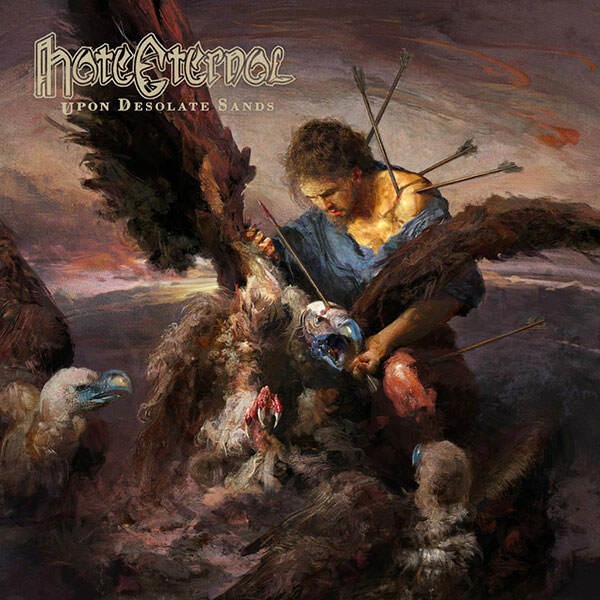 Death metal legends Hate Eternal will release their highly anticipated new album, Upon Desolate Sands worldwide on October 26. Pre-orders for the album are available across CD and LP formats at the Season of Mist E-Shop. Death metal juggernaut Hate Eternal return with their heaviest and most ambitious album to date. Helmed by extreme metal luminary Erik Rutan, the new album sees the band take another huge step forward in their quest to push death metal to its outermost limits. From the scorching opener "Violent Fury," through to the epic, hypnotic, two-part title track closer, Upon Desolate Sands showcases a band operating at peak performance and sees Hate Eternal raise the bar yet again. Upon Desolate Sands was produced by Rutan at his Mana Recording Studios, and features artwork by Eliran Kantor (Testament, Atheist). The track list can be found below.